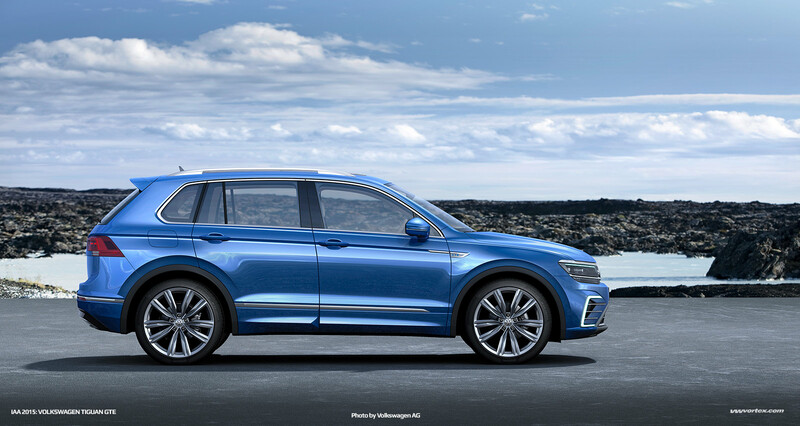 In addition to the standard and R-Line Tiguan, Volkswagen will also display the Tiguan GTE- the brand’s first foray in to a GTE-branded SUV. 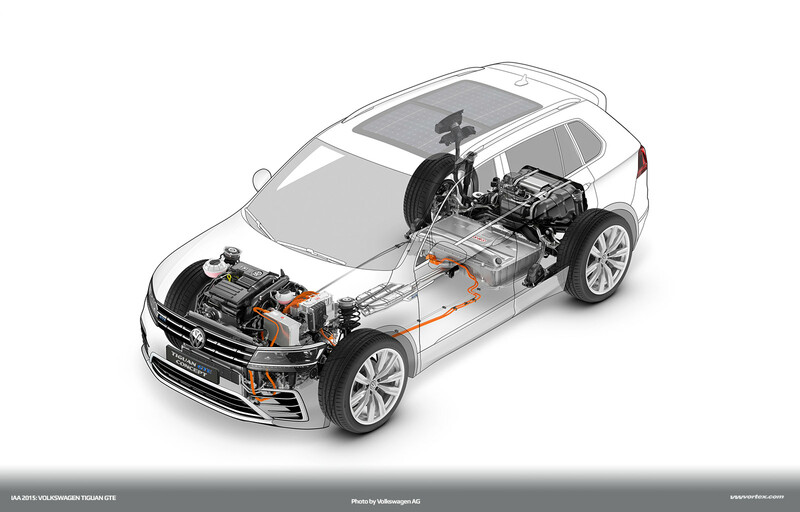 Featuring a solar panel roof to assist in charging the lithium-ion battery units, the Tiguan GTE can go up to 50km (31 miles) as a full electric, and consume just 1.9l/100km (123mpg) when paired with it’s 1.4 TSI petrol engine. Those more interested in outright speed than being frugal will no doubt take some comfort in the Tiguan GTE’s 8.1 second sprint to 62mph, and top speed of 120mph. Wolfsburg / Frankfurt, September 2015. 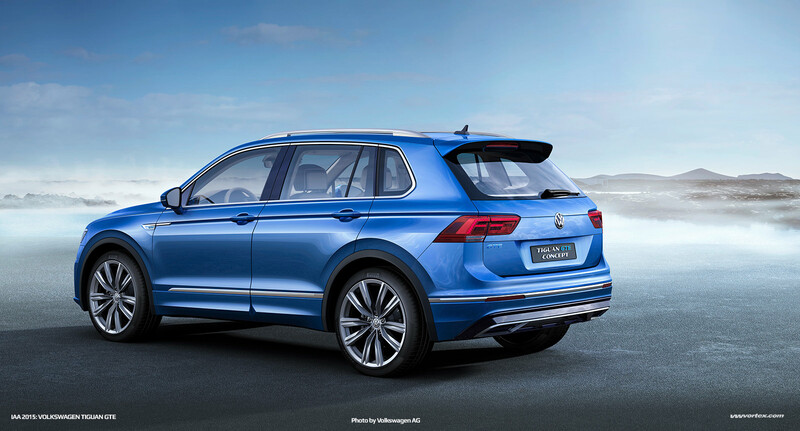 Demonstrating the future directions the Tiguan might take is the Tiguan GTE – the first plug-in hybrid SUV from Volkswagen, which the brand is showing at the IAA. This Volkswagen, which is being presented as a concept vehicle, develops a system power of 160 kW / 218 PS and can cover a distance of up to 50 km in “E-Mode” driving as an all-electric zero-emission vehicle. Its average fuel consumption (combined) is a mere 1.9 l/100 km; this equates to a CO2 emissions figure of 42 g/km. The relatively long electric driving range not only benefits from the externally chargeable lithium-ion battery with an energy capacity of 13.0 kWh, but also from a solar module that is integrated in the roof – a world exclusive. Under ideal conditions, the energy that it generates annually is sufficient to add up to 1,000 km of driving range (Germany 500 km, Southern Europe 800 to 1,000 km), depending on the regional solar radiation power. TSI plus E plus DSG. The concept car is driven via its front axle by a direct-injection turbocharged petrol engine (1.4 TSI with 115 kW) and an electric motor. The lithium-ion high-voltage battery supplies the electric motor with energy. 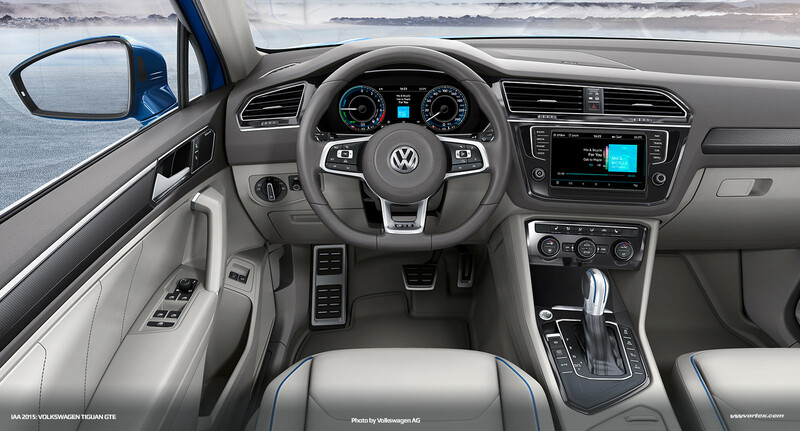 The Tiguan GTE operates with a 6-speed dual-clutch gearbox (DSG) that was specially developed for hybrid use. The electric motor was integrated into the gearbox housing. Additional components of the hybrid drive include the power electronics (converts DC power from the battery to AC power for the electric motor) and a charger. The Tiguan GTE can be driven in the described E-Mode or in one of the three other modes Hybrid, Battery Charge, or GTE. After starting the drive system, the concept vehicle automatically drives off in “E-Mode”. When a minimum charge level of the battery has been reached or when there is very high demand for power, the drive system automatically switches over to the “Hybrid” mode. This means that “E- Mode” is deactivated, and the Tiguan GTE now behaves like a classic full hybrid vehicle. It charges the battery regeneratively during deceleration and automatically uses the TSI and/or electric motor according to the driving situation. By pressing the “E-Mode” button, the driver can manually switch to zero-emissions operation if necessary. 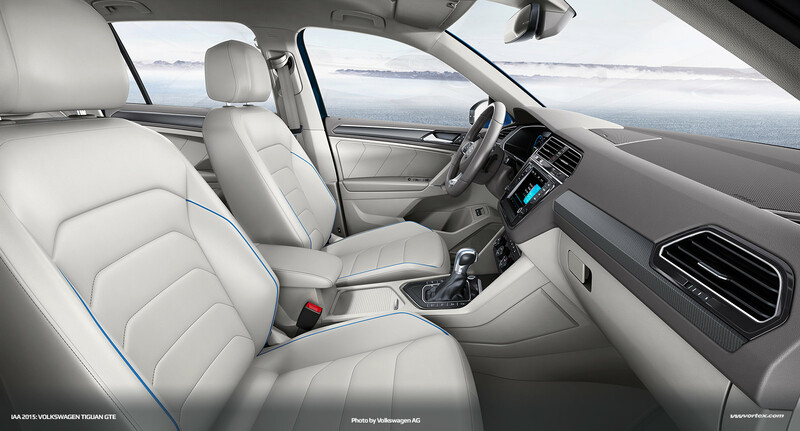 Exclusively driven by electric motor, the Tiguan then has a top speed of 130 km/h. GTE mode as boost function. The driver presses the GTE button to switch to GTE mode, which activates a very agile side of the concept car. 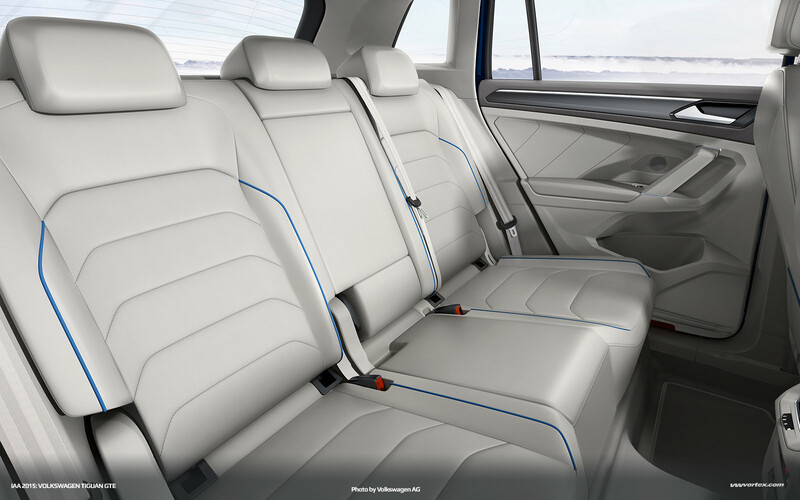 This GTE mode is an exclusive feature of all Volkswagen vehicles with a plug-in hybrid drive system. The characteristics of the accelerator pedal, gearbox and steering are made noticeably more dynamic, and the tuning of the TSI is more performance oriented. 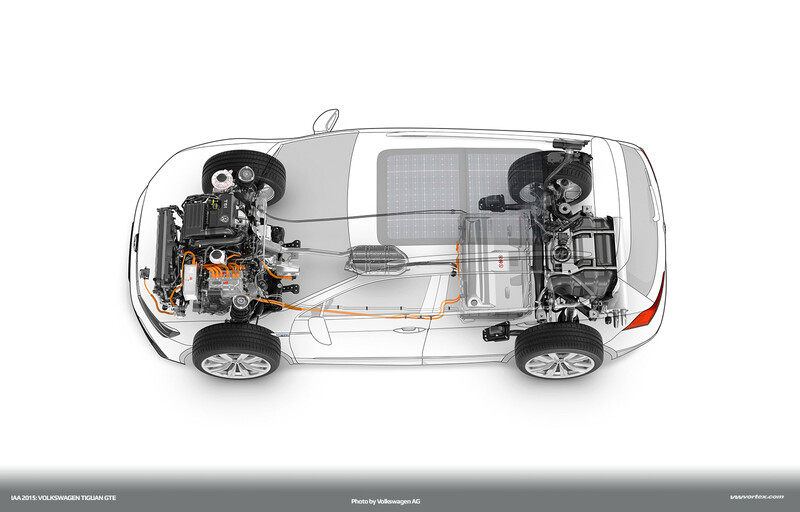 In addition, in the GTE mode the TSI and electric motor work together in what is known as “boosting” which makes the full system power and the maximum system torque available. 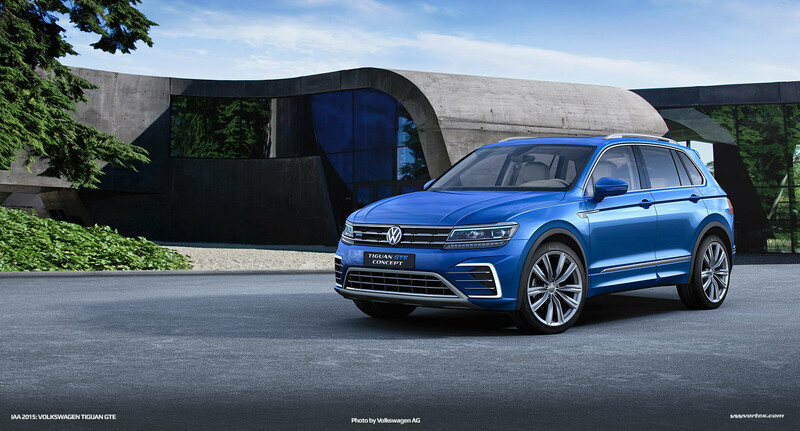 The Tiguan GTE then has a top speed of 200 km/h and accelerates to 100 km/h in a short 8.1 seconds. El mejor producto Vw en muuucho tiempo. Lo último que está a su altura fue el Passat CC. Y mira que hacen años desde el primero. Este GTE es una autentica pasada, elegante y deportivo.